Then the devil took [Jesus] up and revealed to him all the kingdoms of the world in a moment of time. "I will give you the glory of these kingdoms and authority over them," the devil said, "because they are mine to give to anyone I please. I will give it all to you if you will worship me." Jesus replied, "The Scriptures say, 'You must worship the LORD your God and serve only him.'" These verses give us a great demonstration of Jesus' love for us because his crucifixion would not have happened if he had not resisted the devil here. He was offered a shortcut to world dominion, one that would not require his suffering and death. 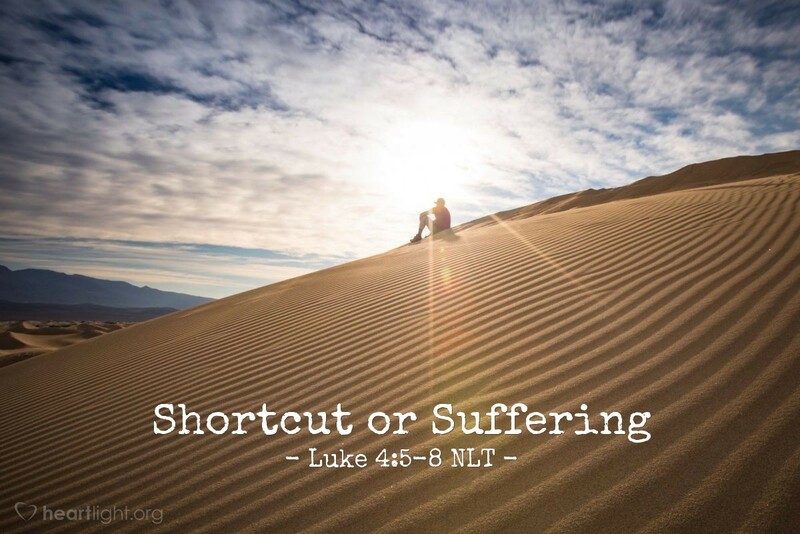 Yet he chose the long hard road that led to Golgotha because of his love for us. Jesus would not compromise on this preeminent truth — only God is to be worshiped and honored as God! No matter the risks, costs, or consequences, Jesus reminded us that we are to serve God alone! Father in heaven, only you are the one true living God whose love endures from one generation to another. Give me an undivided heart to serve you wholeheartedly and without rival. In Jesus' name, I pray. Amen.